A few years back my shakuhachi cracked and I was wondering if I had 'over cared' for it too much....... ie; let it get too wet. I regularly put it away in a sealed plastic bag along with a damp piece of tissue which sometimes had some mold on it if left for any time. And sometimes I would wrap it in a damp cloth which made the bamboo very dark and wet. The shakuhachi was never left in the cold, however one warmish summer day I took it out doors to play and the next day it had split! There was not a drastic change in of temperature. One note of the shakuhachi resounds endlessly piercing the winter clouds. 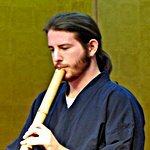 In my experience, my Shakuhachi cracked due a change in temperature and humidity, I suspect in your case the change from being very wet and then being outdoors may have caused the split. I'm not sure keeping them wet is a good idea, what I've been advised to do is to keep them well oiled (I use tsubaki oil) and keeping them somewhere with well regulated temperature rather than somewhere where temperature could vary. Hope your flute is alright!